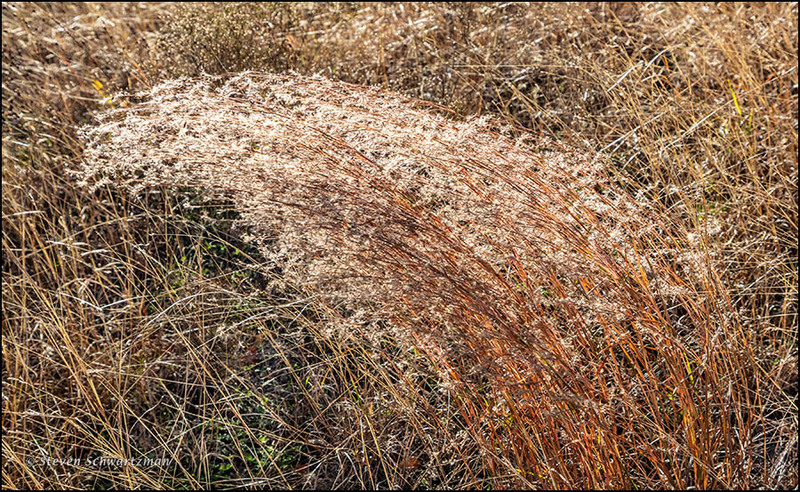 In addition to the bushy bluestem grass that’s a delight here in the fall, little bluestem (Schizachyrium scoparium) also has its autumn appeal. On the afternoon of December 1st I stopped at an undeveloped lot on the corner of Heatherwilde Blvd. 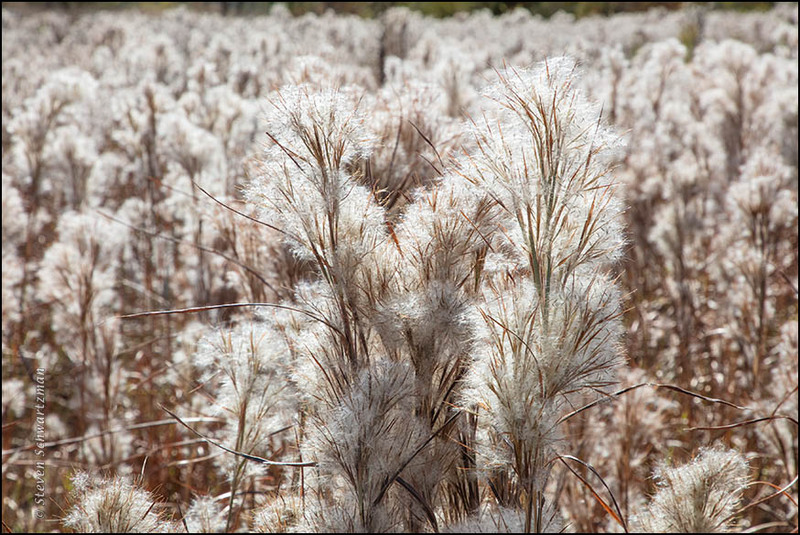 and Yellow Sage St. in Pflugerville to photograph the backlit clump of little bluestem you see above. The wind kept blowing the normally upright stalks into arcs that I was able to record unblurred before they sprang back up by setting my camera’s shutter speed to 1/1000 of a second. Five days earlier I’d gotten down in a ditch along Spicewood Springs Rd. 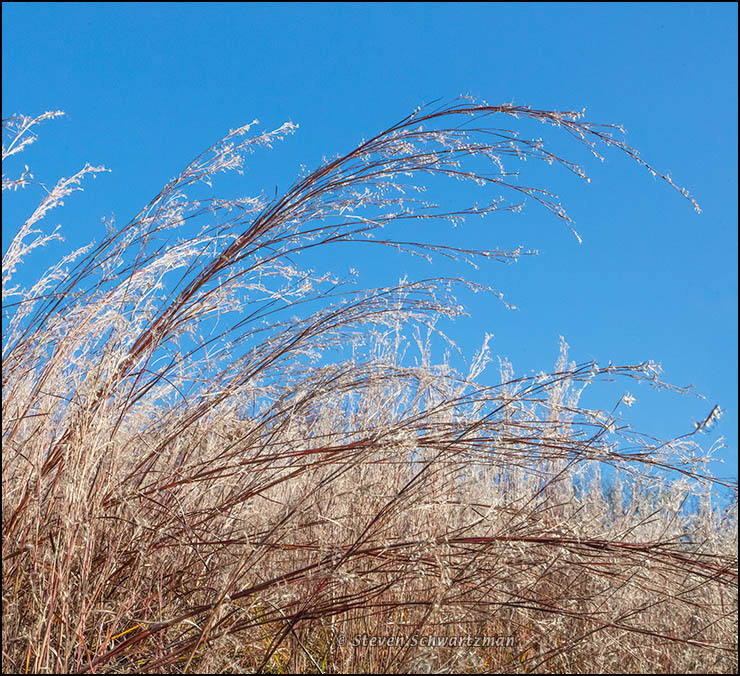 so I could aim up into a clear blue sky while also portraying some little bluestem seed heads forming arcs in the breeze. That time 1/500 of a second sufficed. If you’re reminded of Hokusai’s Great Wave off Kanagawa, so am I. 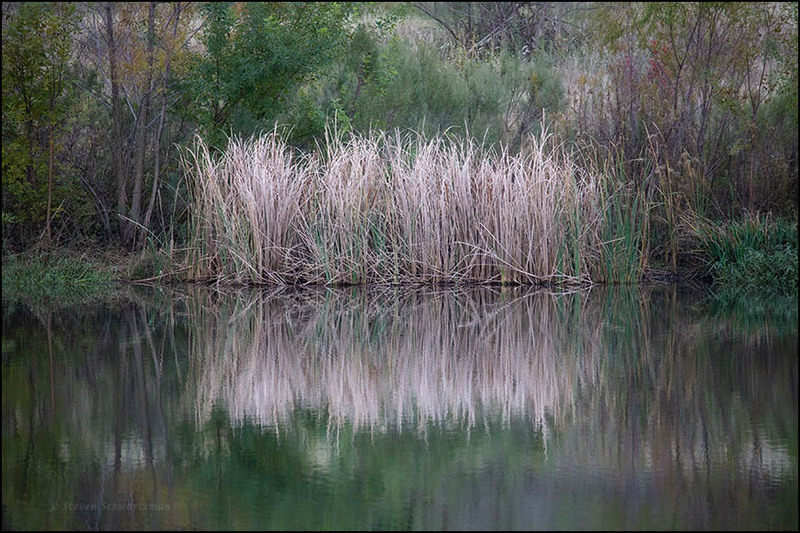 Here are two subtle views of fall from the Riata Trace Pond on the overcast afternoon of November 21st. 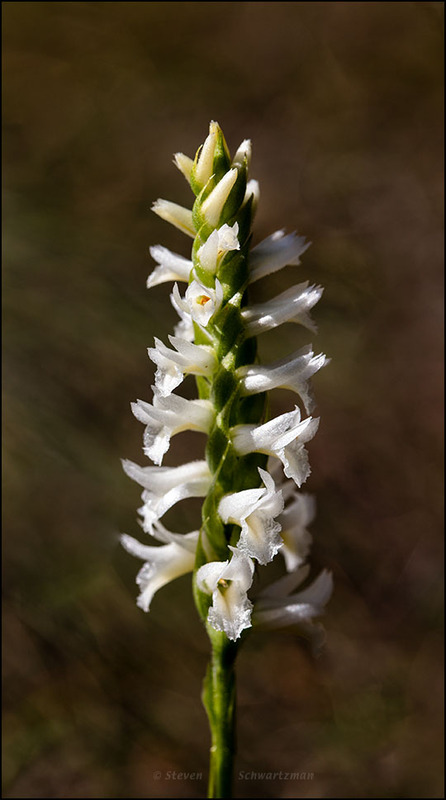 As you probably already knew and recently heard here, compared to the northern United States, Texas is too far south and therefore too warm for a lot of grand fall color. Most of the relatively little we get leans more to yellow and brown than to red. That said, one saturated red we count on seeing as autumn advances each year is that of a ripe tuna. 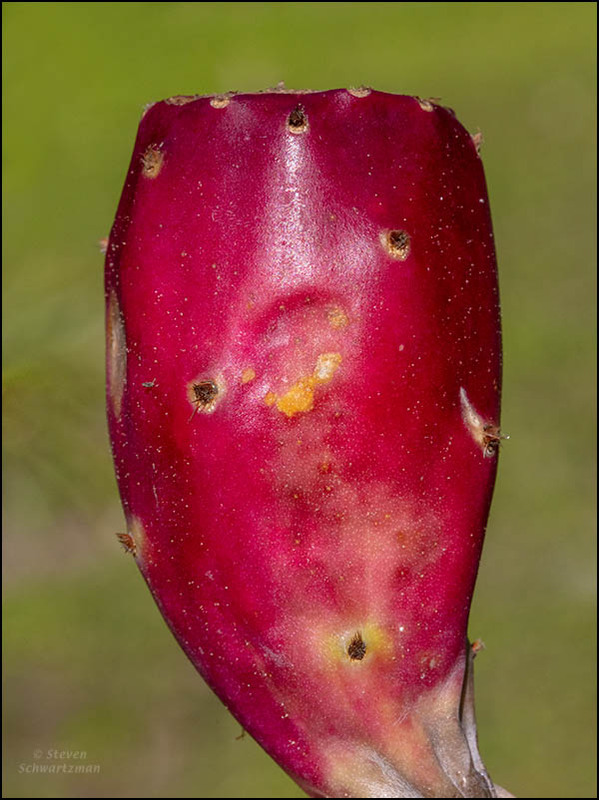 In this case it’s obviously not the word for a fish: Spanish uses tuna to designate the fruit of a prickly pear cactus (Opuntia spp. ), and English has increasingly followed suit. When I made up the post’s title I planned to include only the view from above, above. 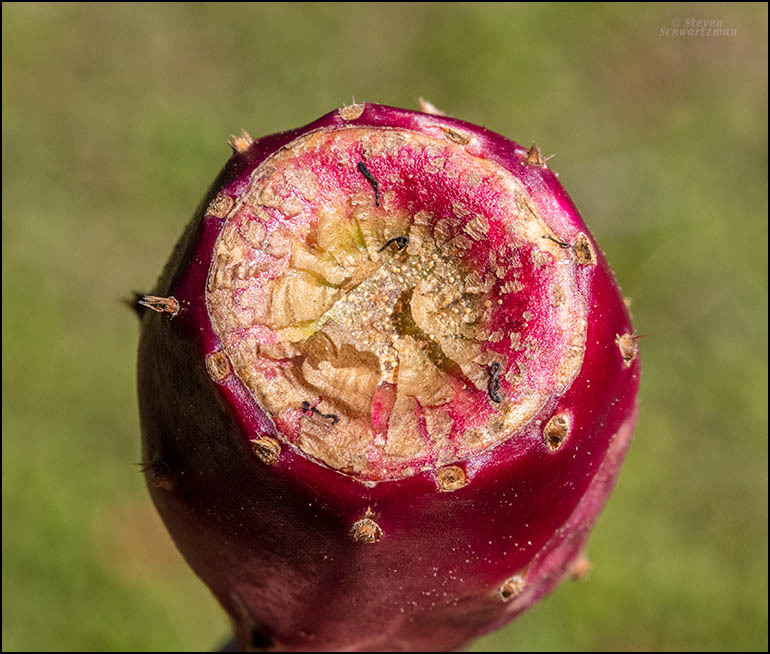 Later, for people not familiar with this kind of fruit, I added a view from the side, below. These pictures come from my neighborhood on November 2nd. The sheen is natural; I didn’t use flash. 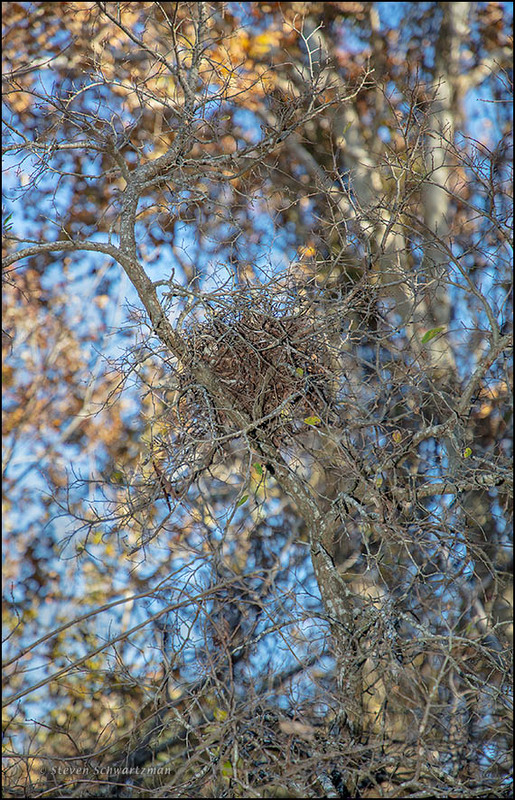 After leaves have fallen, trees reveal summer-hidden branches and sometimes things within them, like the nest now disclosed here. This bare tree, while neither massive nor colorful like the still-clad oak you saw yesterday, nevertheless appeals in the intricacy of its many slender branches and twigs. Visible beyond it you can make out upper parts of a sycamore tree (Platanus occidentalis) tall enough to catch light from the late-afternoon sun. Though the tree with the nest in it had no leaves left to help with identification, it might have been a cedar elm (Ulmus crassifolia). I have no idea what kind of animal made the nest. 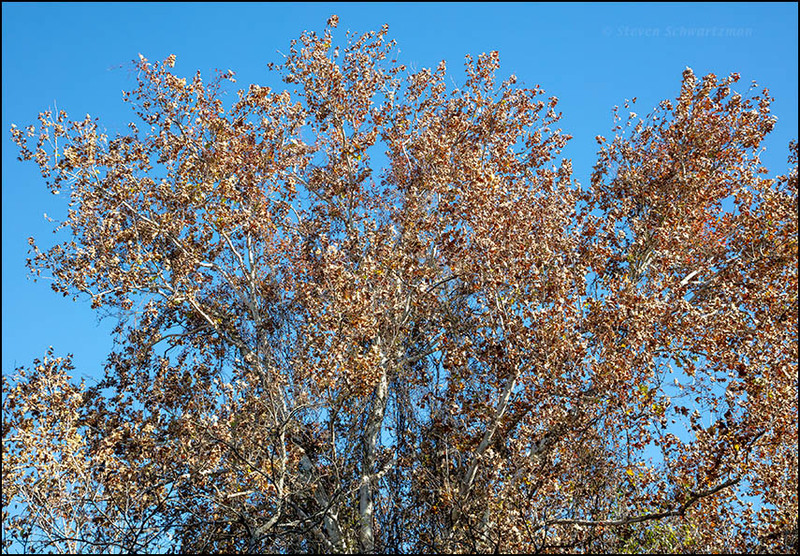 Below is an unobstructed view of the sycamore’s browning crown in its own right. 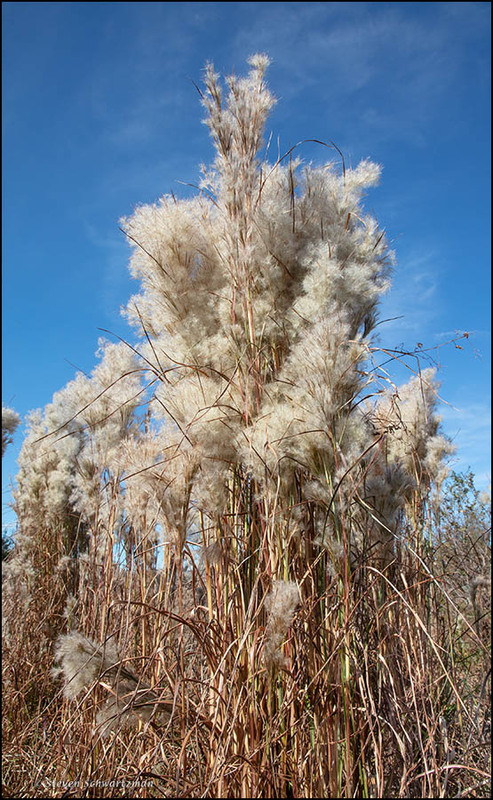 On November 15th I returned to Meadow Lake Park in Round Rock to see what the morning light could do for the large stands of bushy bluestem (Andropogon glomeratus) that had caught my eye there but that I hadn’t photographed during my afternoon visit 11 days earlier. This is the showiest of the native grasses I regularly see in central Texas as the end of each year approaches. And speaking of native, that’s what this grass is on damp or wet ground in parts of many American states, as you can confirm on the USDA map (use the slider there to zoom in to the county level). and in the second photograph mostly from behind the camera. 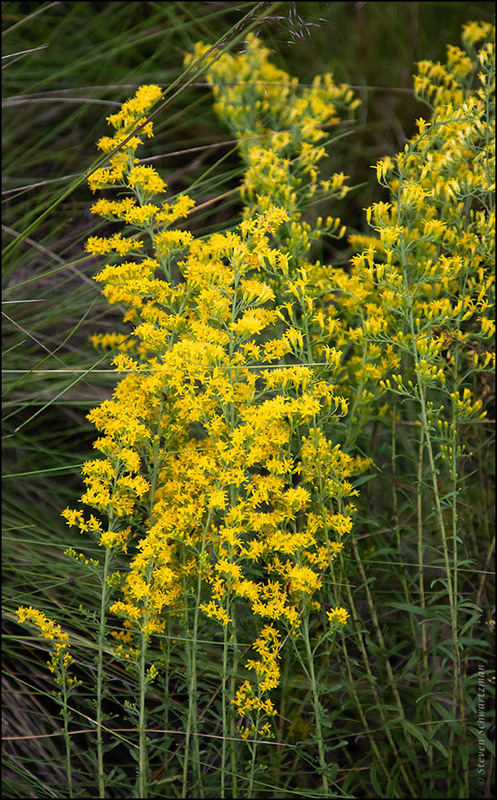 At the Lady Bird Johnson Wildflower Center on September 26th I found my first flowering goldenrod for 2018. 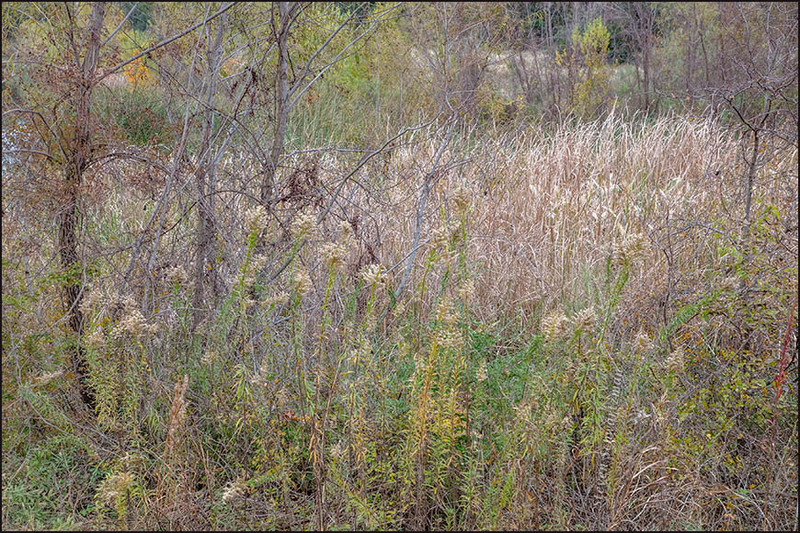 It was prairie goldenrod, Solidago nemoralis. 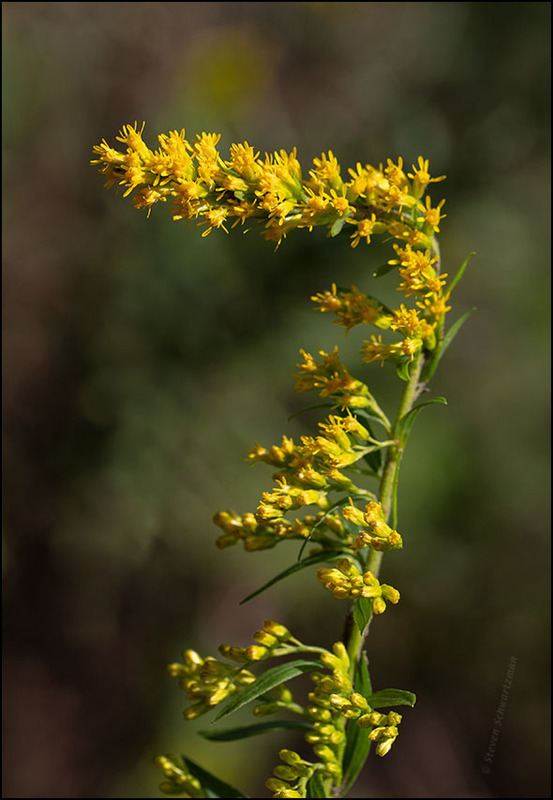 Then on September 4th on the far side of my neighborhood I photographed a tall goldenrod, Solidago altissima, that wasn’t as tall as it should have been because something had caused the inflorescence to take a 90° bend. I believe it’s the only right-angled goldenrod inflorescence I’ve ever seen.